The 16th Street Baptist Church in Birmingham, Alabama not only served as a house of worship for its predominately black congregation, but it also was a meeting place for organizers of the Civil Rights movement, including Dr. Martin Luther King Jr. Many of the 1960s Civil Rights marches in Birmingham began at the 16th Street Baptist Church. Members of the Ku Klux Klan often called in bomb threats to the church during civil rights meetings and church services. On September 15, 1963 at 10: 22 a.m., they made good on their threat. Most of the 200 parishioners were able to escape when a bomb detonated on the building’s east side, except for four young girls. 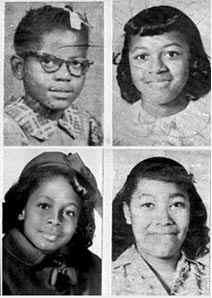 Cynthia Wesley, Addie Mae Collins, and Carole Robertson, all 14 years old, and 11-year-old Denise McNair were found buried in the rubble of the church’s basement. More than 20 other church-goers were also injured during the explosion. This bombing was the third one in 11 days in response to a federal court order to integrate Alabama’s schools, and black protesters arrived at the scene after the incident. When the state’s governor George Wallace (who vehemently opposed desegregation) sent in police and state troopers to end the demonstrations, violence erupted in Birmingham, and some protestors were arrested. Two young black men were killed, one by the police, before the National Guard was called in. Despite the fact that many in Birmingham knew who was holding the smoking gun, it took a ridiculous amount of time before anyone was brought to justice for the bombing. Alabama Attorney General Bob Baxley reopened the case fourteen years after the event, in 1977, which led to former Klan leader Robert E. Chambliss facing trial and being convicted of four counts of first-degree murder. According to his niece, Elizabeth Cobb, Chambliss told her before the bombing that he had “enough stuff put away to flatten half of Birmingham.” He died in prison in 1985. In May 2001, Thomas Blanton was found guilty of first-degree murder and received four life-term sentences. The following year, Bobby Frank Cherry received the same sentence, and died in prison two years later. Herman Frank Cash, a fourth suspect, died in 1994 before he could face trial. Too little too late? Perhaps, but at the very least the outrage from the Birmingham church bombing and its aftermath helped provide that extra push that would bring about the Civil Rights Act of 1964 and the Voting Rights Act in 1965. If these cruel and tragic events can only awaken that city and state – if they can only awaken this entire nation to a realization of the folly of racial injustice and hatred and violence, then it is not too late for all concerned to unite in steps toward peaceful progress before more lives are lost. Thanks for explaining these facts to today’s public. “The 16th Street Baptist Church in Birmingham, Alabama … served as a house of worship for its predominately black congregation …”. I think that the word, “predominately” should have been omitted. I do not believe that this church had ANY members other than descendants of African slaves. (2) some people do not enjoy the music or “style” of worship (or even the politicization in preaching) that is used by congregations that are predominantly members of a race other than their own.